Andrew's diner isn't fancy. It's just a wholesome clean place to get a great bite to eat. This place has a loyal local following, and people line up on the benches outside for lunch. Don't get sassy with the staff. The owner is not shy about giving you a tongue lashing if you deserve it. I went there once for breakfast on the way to the airport. Food was very good and a big variety to chose from. 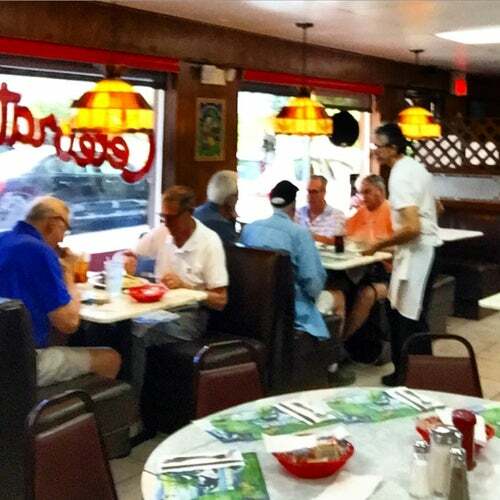 I've been coming to Fort Lauderdale for 11 years and always make a point of stopping at Andrews Diner for lunch. The food is very good and you can't beat the price. I usually get their cesear salad with poached salmon. It comes with a choice of home made soup and rolls. Anywhere else, this would probably cost at least $15. Andrews charges around $8 (if my memory serves me right).